Some new photos from the Joker origin movie have made their way online. Ever since cameras began rolling on the upcoming DC movie, the internet has been utterly fascinated with the project. Whether or not it actually winds up being any good is another question entirely, but nevertheless, this has managed to get people's attention. Now, we have ourselves some new photos, which feature star Joaquin Phoenix, who plays the man that becomes the titular character, with his co-star Zazie Beetz, who audiences may know from Deadpool 2. 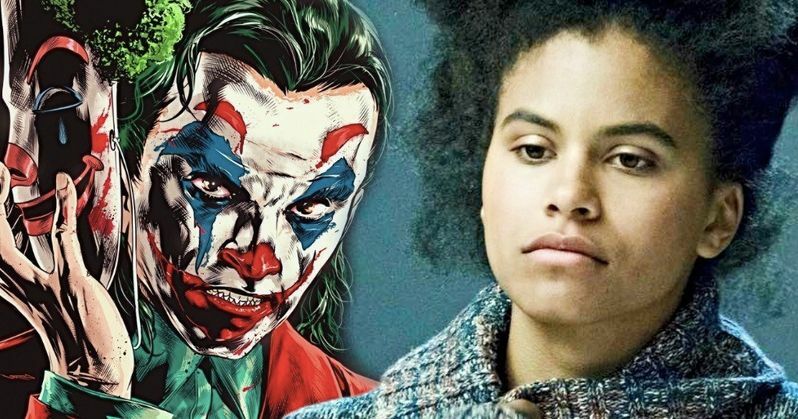 The photos aren't the most action-packed that we've seen so far, but they showcase some of the intimacy and more toned-down elements that will be at play in Joker. Arthur Fleck (Joaquin Phoenix) and Sophie Dumond (Zazie Beetz) are gathered together at a dining establishment having a chat and, as we see in the photos, Fleck is getting rather animated and has managed to keep Sophie's attention, who is smoking a cigarette during the encounter. The scene was reportedly filmed in New York at a local donut shop. In the world of DC Comics, The Joker's origin story has been intentionally left quite vague, as to keep the mystery surrounding the villain alive. But this movie is going to fully explore that story, showcasing how a man winds up becoming one of the most iconic, psychopathic villains in pop culture history. We've already seen photos of Joaquin Phoenix in his full Clown Prince of Crime getup, as well as photos of him in more traditional clown attire. This movie would be interesting anyway, but the fact that it's Phoenix, who is arguably one of the best actors working today, in the makeup, it's downright fascinating. Todd Phillips, who is best known for his work on The Hangover trilogy, is in the director's chair and he co-wrote the screenplay with Scott Silver of 8 Mile fame, only adding more to the intrigue. The cast also includes Robert De Niro, Marc Maron and Frances Conroy, who will be playing Arthur Fleck's mother. Brett Cullen was also tapped to replace Alec Baldwin, who had previously been cast in the role of Thomas Wayne, father of Bruce Wayne, the man who becomes Batman. It hasn't yet been revealed if we'll be seeing Bruce Wayne show up. Warner Bros. is taking something of a risk with this movie, setting it outside the continuity of the current DC universe, which consists of movies like Suicide Squad and Justice League. It's going to have a smaller budget and will stand on its own two feet. The hope is that they will launch a new production banner for future DC projects that can take a similar approach. That could allow for some really cool comic book movies in the future, but we'll have to see how this turns out first. Joker is set to arrive in theaters on October 4, 2019. Be sure to check out the new set photos, which originated over at Just Jared, for yourself below.